(Photo: . 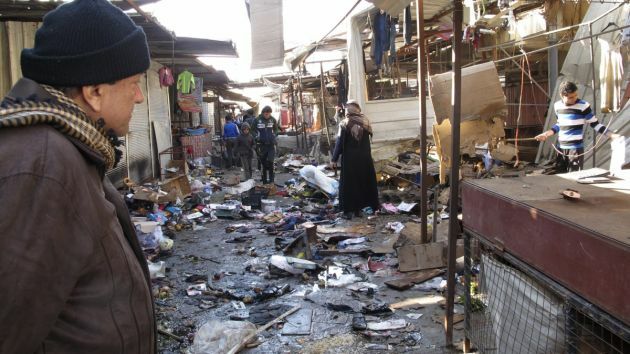 REUTERS / Ahmed Malik)A man looks at the site of bomb attack at a marketplace in Baghdad's Doura District December 25 2013. At least 20 people were killed in bomb attacks in Christian areas of Baghdad on Wednesday, including a car bomb that exploded near a church after a Christmas service, police and medics said. Two bombs also went off in a crowded market in a separate, mostly Christian area in Doura, killing another six people and wounding 14, police and medics said. Members of Jihadist group the Islamic State in Iraq and the Levant (ISIL) are believed to have unearthed the remains of revered biblical Prophet Jonah in Mosul. This act is fueling the fears of Christian leaders in Iraq that the persisting violence could spell the end of 2000 years of Christianity in the country. Iraq's Christians have long faced a siege but the latest onslaught by ISIL, also known as ISIS, has them caught in the crossfire of Islamic sectarian violence and also being directly targeted. A local Nineveh official Zuhair al-Chalabi told IraqiNews.com Friday there was information "certainly confirming" that members of the militant group dug up and disturbed the grave of the prophet in the capital of northern Iraq's Nineveh Province. A video of the attack believed to be on the revered tombstone of prophet Jonah has also been posted on Youtube. Al-Chalabi said members of ISIL have gained control of the mosque of the Prophet Jonah ever since they invaded the city, about 400 kilometers (240 miles) northwest of Baghdad. "It is still held by them...elements of ISIL engaged in the process of tampering with the contents of the mosque," he was quoted as saying. The group has also torched 11 churches and monasteries out of the 35 across the city. It has destroyed statues of poets, literary and historical figures important to the city, all in a day, IraqiNews.com quoted police spokesman Maj. Ahmed alObaidi, Ninawa as saying. The looting and violence in Iraq have driven Christians away to neighboring countries like Turkey, Lebanon and to Western Europe. If this persists, the it will likely hasten the demise of the nearly 2,000-year-old Christian heritage in the country, archbishops from Baghdad, Mosul and Kirkuk have warned, Reuters news agency reported. The church leaders recently visited Brussels seeking the help of the European Union to protect the faithful. The Christian leaders said war and sectarian conflict have depleted Iraq's Christian population from 1.5 million before the US-led invasion in 2003 to a mere 400,000. "The next days will be very bad. If the situation does not change, Christians will be left with just a symbolic presence in Iraq," said Baghdad-based Chaldean Catholic Patriarch Louis Raphael Sako. Youssif Mirkis, Kirkuk's Chaldean Catholic Archbishop, also said, "Our presence was a symbol of peace, but there's so much panic and few Christians see their future in Iraq."